Good afternoon! It looks like I didn’t get the retracement I was looking for to go long EURUSD as traders came back from barbeque and fireworks ready to buy! Is it too late to buy now?? Unfortunately, I don’t think we’ll see the pair drop back down to 1.2400 as it looks like the change in price action behavior last week has carried over to this week. US ISM Non-manufacturing came in weaker than expected at 53.8 vs. the 55 forecasted by analysts. The US Dollar broadly sold off against the majors; EURUSD rallied above yesterday’s highs and topped out around 1.2665. With the trend still intact and 1.2400 almost two daily ATR’s away from the current market price, I have decided to close down my open orders to buy at 1.2400 and look for better opportunities for the week. No trade. There’s still plenty of action left in the week, so stay tuned for potentially new trade ideas as I continue to watch the majors. Good luck and good trading! Good evening Forex friends! 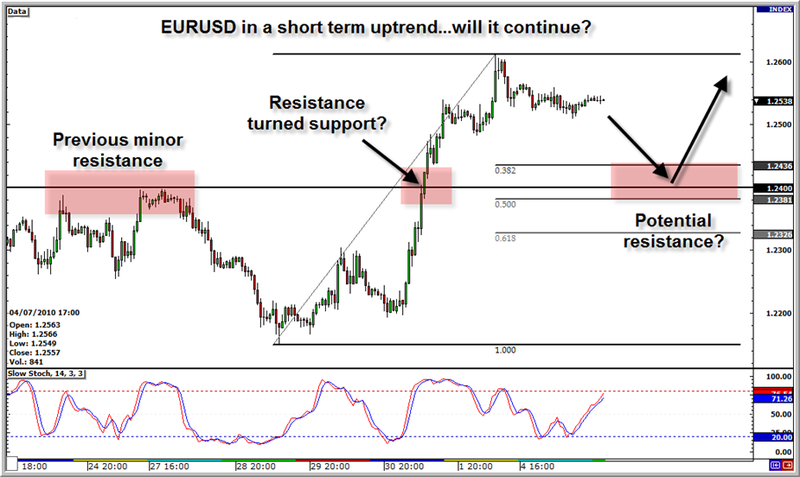 I have a basic short-term trade idea on EURUSD that I look to play if we see the euro pullback on recent strength. Is the recent trend higher gonna stick around for a bit longer? I have the one hour chart up, and we can see the pair has been moving higher after hitting lows around 1.2150 last week. Using the Fibonacci tool, I can see that there is potential support between the 38% and 61% Fibonacci retracement area. This area lines up with a minor “resistance-turned-support” area around 1.2400. Has it really turned into support? I don’t know, but if it does retest that area, the trend and risk-to-reward ratio may make it worth finding out. Fundamentally, there hasn’t been much change since last week when we saw weak data from the US spark strong moves in the markets. The only difference is HOW currencies are moving after US housing and employment data came out way worse than expected. Rather than a flight to the “safety” of US assets, we saw the opposite which lead to a broad sell off in the US Dollar. Will this new market behavior stick? Of course, we won’t know until it happens, but as a trader I’ve gotta go with what I see–USD weakness on bad US data. So, that’s what I am gonna do this week. If the market moves down to the highlighted area of potential support, I will go long. My stop will be the daily average true range of EURUSD (around 150 pips). My target will just below the previous week high and current week open as I see it as potential resistance, and my second target will be one daily ATR above my first profit target. We have plenty of data on the Forex calendar to spark some moves this week. Most notable would be US ISM Non-Manufacturing Survey (Tues. 2pm GMT) and the ECB interest rate decision (Thurs 10 am GMT). Stay tuned as I may adjust my open orders/position ahead of these events. Thanks for checking out my blog!